2007: Music in the Blood? In cooperation with the Droste-Hülshoff-Gymnasium in Rottweil research work was carried out to look into the influence of different kinds of music on the human body. The students Annette Kolb and Katharina Sinner inspired by work shown in the exhibition “World in a Drop” asked Prof. Kroeplin to explain to them the method of droplet analysis. They were then allowed to borrow the institute's dark field microscope to carry out a sample row of their own. Under the supervision of their teacher Michael Lamberty they tested the effects of various pieces of music on the droplet structures of water, blood and urine. Below is a summary of their findings and conclusions. After a 30 minute pause the body fluids were allowed to “reneutralise” and the next test row could begin. The dark field microscope provides the most “articulate” visual results allowing for a precise distinction of the effects of different music styles on bodily water in blood. 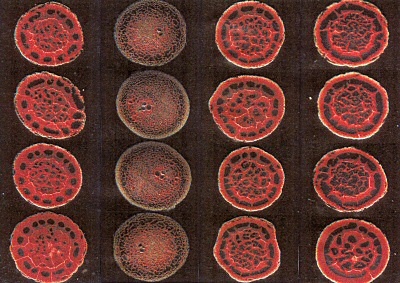 Pictures: The samples are arranged top to bottom, each column corresponding to the type of music effecting the body. Blood has an astonishingly clear and calm drop structure. Normally the drops remind us of punched disks or wheels. An outer ring is broken through by a regular row of holes (mostly 14 to 18). Strong spokes are situated between these holes. A thin clear line being permanently interrupted outlines the interior within which the red blood matrix is pierced by by randomly positioned holes. When listening to soft piano music by Eric Satie (while listening both test persons felt a deep sort of relaxation) the drops on the glass slides seem to vibrate. There is a soft and broad clear outer ring within which one can detect a ring shaped zone resembling perforated netting. This gives a dark shade to the ring. The interior structure looks like a smoothly curled basketwork. At some points the circular structure of the drops is softened. Melodic rock music seems to correspond to the natural beating of the heart. 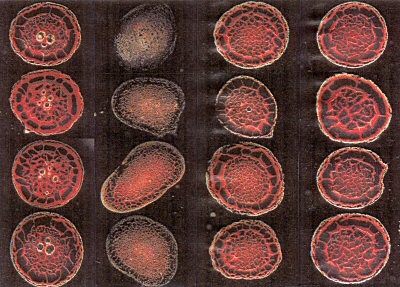 The blood structure after having listened to Deep Purple looks very much like the original natural structure, the windows of the outer ring are, however, larger and the spokes smaller. In the cases where the spokes do not reach the outer ring the windows are interlinked. The interior contains more dark holes and looks like a rougher layout of the Satie drop samples. The samples are arranged top to bottom, each column corresponding to the type of music effecting the body. Quotations and photos from “Music in the blood?”, a research project by Annette Kolb and Katharina Sinner, INSTI-Networking Rottweil, 2007, Participating in the “Youth in research” competition. The research study proves that music has strong impact on bodily fluids. Furthermore, the strucutre of the samples can reveal the type of music the test subject had been listening to. Further tests (as described above) were carried out on samples of saliva and urine. The differences in samples were however not as apparent as those observed with blood with one exception. The urine droplets exposed to music by Otep showed strong disparities when compared to other samples. Tests on saliva showed differences primarily in the inner structures of the droplets. The students conclude that human beings' perception of music is not limited to the ears but rather the whole body absorbing and perceiving the various sonic waves through bodily fluids as well. Measurable positive impact on blood pressure, pulse and respiration was documented in a study with 60 volunteers at the University Hospital Marienhospital in Herne. Listening to Johann Sebastian Bach's Orchestral Suite No. 3 lowered the upper (systolic) blood pressure by an average of 7.5 to 4.9 mmHg (millimeters of mercury) and the lower (diastolic) value by almost 5 mmHg: So on blood pressure values - by example - 140 to 90 mmHg to about 132 mmHg to 85. Also, the pulse slowed down measured with the test subjects by an average of seven beats per minute. And lower blood pressure and pulse values relieve the congestion on the heart. And what should one listen for positive effects on the cardiovascular system and to feel the relaxation through music? Cardiologist Prof. Dr. med. Hans-Joachim Trappe, director of the Medical Clinic II at the University Hospital St. Mary's Hospital recommends especially pieces of the composer Albinoni, Bach, Corelli, Handel and Mozart and Tartini. And also the own favorite music gives you the good mood in the autonomic nervous system.